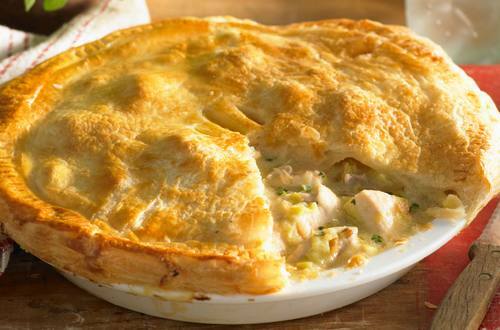 Follow our chicken and leek pie recipe for the perfect winter warming pie. Part of the hearty winter recipe collection produced by Continental. 2 In a heavy frying pan, melt 1 tablespoon of spread and cook chicken until lightly golden set aside. Melt the remaining spread in the same pan cook the leeks without colour, until softened. 3 Add flour and cook for a further 2 minutes. Add milk and Continental stockpot, stirring continuously until slightly thickened. Add chicken back into the pan, reduce heat, simmer gently for 10 minutes or until chicken is cooked. Stir through parsley. 4 Transfer to a lightly greased pie dish. Glaze the rim of the dish with a little of the beaten egg. Lay the pastry sheet over the dish and mould it around so it holds in place, press your fingers around the edges to seal and cut a small slit in the top. Brush pastry with beaten egg. Bake for 20 minutes or until pastry is golden brown.